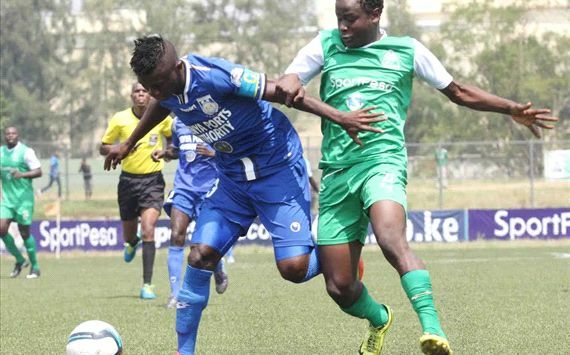 Gor Mahia dropped more points after being held to a barren draw by a stubborn Bandari side in Kisumu on Sunday. K’Ogalo came into the match knowing anything less than a win will once again open the gap between them and leaders Tusker, who had won 2-0 against Mathare United on Saturday. The Dockers came into the match aiming for maximum points considering the fact that they had lost 2-0 when the two teams met during the first leg. Meddie Kagere was benched with Jacques Tuyisenge being preferred by coach Ze Maria, as Wilson Obungu was recalled to start for the visitors after missing the match against Sofapaka following his dismissal against Muhoroni Youth. K’Ogalo’s intetions were made clear as early as the second minute as they started the match pushing for an early opener, but the opponents’ defense led by Felly Mulumba stayed calm and cleared the ball. It was the home side that enjoyed possession in the early stages, making dangerous moves which caused a scare to a few travelling fans. In the 10th minute, Goddfrey Walusimbi made a good run on the left wing, trying to cut the ball in, but his effort missed the target, Tuyisenge, by inches. Two minutes later, it could have been 1-0 up in favour of the hosts as Francis Kahata found space in the danger zone, but his effort went wide with Obungu well beaten. The first half was characterised by distance shots from the likes of Walusimbi, Kahata and Erick Ouma, with Bandari struggling to get past the sirkal’s defense. In the 60th minute, the hosts could have gone ahead as Mohammed Shariff almost put the ball into his own net, as he tried to play it to goalkeeper Obungu, but the latter saved the situation. Not even the introduction of Baron Oketch and Meddie Kagere could save the situation for the champions, who have struggled to score since the departure of Michael Olunga.